As of today, we have nearly 6500 words in the Signing Savvy dictionary. We are continuously updating our dictionary of signs. In fact, to date we have added around 100 new signs each month. 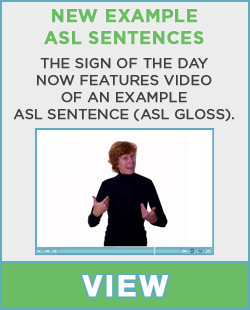 Our goal is to have the most comprehensive video dictionary of signs on the web. However, to be a complete dictionary you need to include words and phrases that some may consider mature. We are beginning to include mature words, not only because we want to have a complete dictionary of signs, but also because it is especially important for healthcare workers and patients, social workers, and educators to have access to this vocabulary. Terms that may be considered mature are marked as mature in our dictionary. Mature signs are indicated with the graphic below the word. Labeling words and signs as "mature" can be subjective and we do our best to maintain the integrity of the Signing Savvy site and its audience. If you are a visitor that does not have an account (or you are not logged in) you can search for mature words and the site will indicate that it is in the dictionary but you must be logged in to see the sign. Mature signs do not appear in the browse by letter lists. If you are a registered guest or a member, once you login, you have the option of showing mature signs or not. This can be set as a preference in your account info settings. When you indicate that you do not want to see mature signs, the mature signs will not show up in the browse by letter list. If you search directly for a mature sign, the site will indicate that it is in the dictionary but you have chosen not to see mature signs. When you indicate that you do want to see mature signs, the mature signs will show up both in the browse by letter list and when you search directly for them. You can change your preferences depending on how you are using the site. For example, if you are demoing signs in the classroom, you may choose to not show mature signs. However, you may turn them back on at anytime. As a learning signer, I like being able to see signs for words that I might never use with my mouth. My hands might sign by mistake something I didn't mean for them to be "saying".